Folks are getting nervous that Rihanna is edging closer to Mariah Carey and Janet Jackson's record for being the second placed female artist with the most top 10 hits on the Billboard Hot 100. 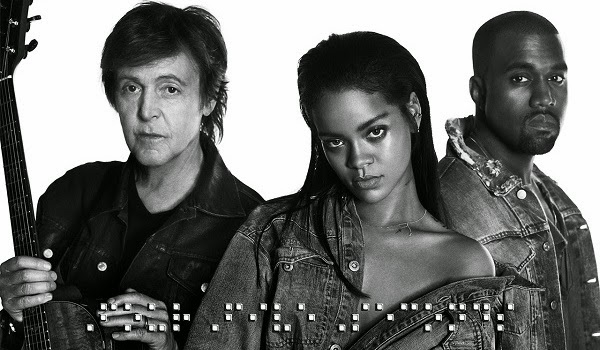 Rihanna's new single‘FourFiveSeconds,’ featuring Kanye West and Paul McCartney, jumps 15-6 on the Billboard Hot 100 this week making it her 26th top 10 single! I think it's pointless getting worked up over something that's bound to happen eventually. When Mariah and Janet achieved their impressive run of top 10 hits, it was done during a different time where digital and streaming did not influence chart positions.Not to take away from Rihanna's achievements, because she certainly works hard and if it wasn't her, it definitely would have been somebody else.